I love these graphs, by the way. If I could add any feature to the NaNoWriMo website, it would be the ability to compare graphs side-by-side, or spliced on top of each other. You could compare your current year’s progress to every other year you’ve participated, or you could compare your own graph to any of your writing buddies’. I think that would be neat. See how the bars are above the goal line? Current word count is 55,483, and I’m still lagging about a thousand behind where I want to be for today. It started with travel plans for the weekend. I thought I would be away on the 21st and 22nd, and I didn’t know if I’d find the time to write. Starting on Monday of last week, I made it my mission to get as far ahead as possible before the weekend hit. Mondays, Tuesdays, and Wednesdays, I have time to write at the end of my workday before it’s time to go home, of which I took full advantage. It was nice. And so the following few days, when I taught right to the end of the school day, I did the same thing. I stayed late at my desk as long as I could, and typed until I had met my word count. Then I cancelled my travel plans at the last minute, and I was already so far ahead and on a role that I said, hang on, I think I can get to 50,000 by Sunday. And so I did. My new goal, 70,000, will bring me a lot closer to the end of the story than 50,000. I’ve written this story completely linearly so far; it starts at the beginning and follows a plot and there are no missing pieces or pieces that obviously don’t belong. This is unusual for me, and after the current mess of my dragon book I find it relaxing. Even if I don’t make 70,000 this month, or if the story still isn’t done at 70,000, I want to keep writing until I find the end. So I’ve decided. I’m going to attempt NaNoWriMo this year. National Novel Writing Month. Writing a 50,000 word novel during the month of November. This is the first year I’ve been in a place where it sounded like a good idea (click for my thoughts on the subject a year ago). It’s a whole month where I won’t be working on Wanderlust, true, but I’ll be getting great writing practice, learning how to fit writing into my schedule, and maybe even making some writer friends in this area. I think it will be a lot of fun. And you probably want to hear about the book. It’s something that I’m personally really excited about, and that I haven’t been able to get out of my head for the past year. Yet even as I’ve been world-building, collecting pieces of plot, and making exciting discoveries about how everything comes together, I didn’t think I’d actually be able to tackle the project for years and years. For a number of reasons. You see, it’s about these two guys. With Wanderlust my main focus right now, it doesn’t seem entirely wise for my secondary project to be ANOTHER story about a couple of guys—even though they (Cor and Tristan) are entirely different characters from Taniel and Vanya, and their story is a completely different sort of thing. The second thing is… it’s high fantasy. Swords and sorcery. Battles and blood. I have read a lot of high fantasy, and it’s one of my most favorite genres, but there’s a lot of it out there, and a lot of it is crap. I… this is probably my own issue, and I’m probably accidentally discounting some really good work, but I have trouble asking people to take me seriously as an aspiring author writing high fantasy when I know there are so many people out there writing books in LOTR inspired worlds with all their made up, fantasy-sounding names and it just isn’t any good. I wanted to establish myself with the urban fantasy, maybe that dystopian kinda book I’m working on, before I ask anyone to take my high fantasy seriously. And this project… It’s not just high fantasy. It’s high fantasy with history, with lore. The actual storyline I want to write deals with the aftermath of the big war ten years before. Beyond that, there’s some really long-ago history about why this [special] [magical] country functions the way it does. And farther back, the mythology. Looking forward, I even have an idea for the thousand years later story when all the magic has faded from the world (… or so everyone thinks!). And those are the reasons I find my own story problematic for me, myself, right now. They’re also the reasons I think it will make a great project for NaNoWriMo. I need something that I’m not under too much pressure to take seriously, especially if I’m going to be banging out 50,000 words in a month. I also tend to have a really scattered writing style on a first draft anyway, and (not sure if this is entirely kosher with the nano rules, and I don’t really care) I’m giving myself permission to work on the lore, the backstory, all the connecty bits, whenever I want to, even if I’m not sure how they fit into the main narrative. It’s all part of the project, and I’m going to let all of that count towards the 50,000 words. And this really is a project I’ve been putting a lot of thought into, despite everything, and I’m excited to see where it goes if I let myself get to work. The project. I haven’t even field-tested the title, you know? What if it just sounds dumb? I called it Tredaf back in high school (yes of course this is a resurrected project, but it’s really honestly changed A LOT since then and anyway I’m starting over from scratch) but that’s the name of the magical country and I think the country itself needs a name-change. The current working title is… badadadum… The Legend of the Blood Tog King. Or just The Blood Tog King. And here’s my question; a real, serious question. You can put your answer in the comments. Does it sound dumb? 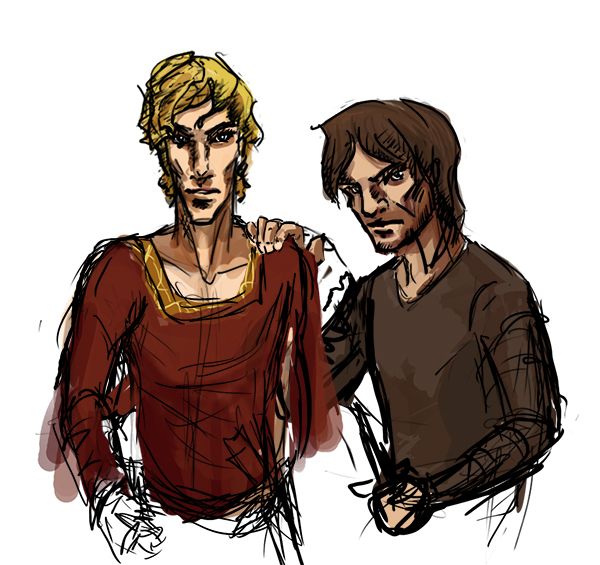 It’s about this guy, Cor Daggerhand, who is blood brother to Tristan, the king. It’s a country where bonds between people have magical properties, and none more powerful, or more dangerous, than a blood bond. [These bindings are symbolized by tokens, worn around the neck or pinned to clothing. Over many years of use, the word “token” degenerates to “tog”, which now describes the whole concept.] Ten years ago Cor and Tristan won the great war, and Tristan reclaimed his rightful throne. Days after the victory, however, Cor skedaddled, and left his brother and the entire country behind him. Upon his grudging homecoming (the start of this book), he discovers that the past ten years have changed Tristan into someone almost unrecognizable—someone with terrible plans for the nation they both call home. Can Cor battle his own blood-brother to keep his beloved country free? And has the king truly turned evil/gone mad, or can Cor save Tristan from himself? It took all summer, but I knocked out the second book in a Song of Fire and Ice by George RR Martin. It’s cool how engrained in pop culture this world has become, thanks in large part to the HBO series that I am not watching because I wanted to read the books first. It’s cool that the more I read, the more apt I am to understand a gazillion memes and facebook references. And while the books are brutal and often hard to take, they are also (or have been so far) consistently compelling, which is a surprise when there are SO MANY characters and plot points to keep straight. The narrative jumps around all over the place, but I’m just as interested in (almost) every piece of it. We’re skipping a few books I read in the interim (and I re-read Dragonhaven, also by Robin McKinley, in the past few months as well), but Shadows is the NEW Robin McKinkey book. The new ROBIN MCKINLEY book. More people should be excited about this. I went to buy the book in hardcover on the day it came out (I’m actually a little ashamed of all the Robin McKinley books I’ve picked up used and at a discount, since she is a living writer that I adore and really want to support) and was sort of expecting that the bookstores would make as big a deal about the new release as I was making about it. You know, like there would be one of those window displays or something. But the local bookstore didn’t even HAVE the title. To their credit, it was ordered, and would be there on Monday, but that was WAY not soon enough. Luckily I was going to the mall anyway, and Books a Million did have the book on release date, but it was nonchalantly just back there on the teen Fiction shelf under M. You know, like it wasn’t even a big deal. I’ve been wanting to read this since it came out over a year ago, but when I read Cashore’s other two [excellent] books they had already come out in paperback (or maybe I first borrowed Graceling from a library, and purchased it later when I started reading Fire?). I really like how the oversize paperback books look on my shelf, and I didn’t want to ruin it by buying Bitterblue in hardcover. I decided to just wait to read it until I could purchase the copy I wanted for my collection. It took a LONG TIME. Now I’m finally reading Bitterblue, and well over halfway through. 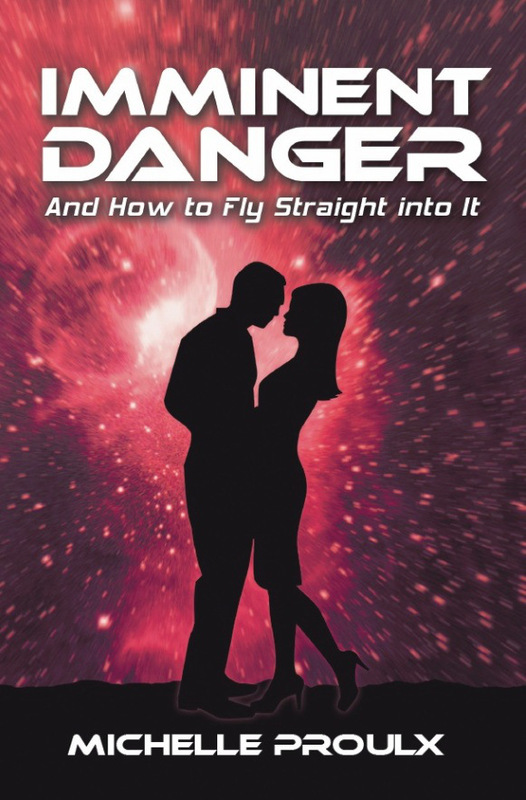 It’s just as good and compelling as the books that came before it, and sometimes very funny. I’m going to have to reread Graceling and Fire again, because while these are all stand-alone, Bitterblue gives us a very different perspective on some of the main characters in the other books, and I want to go back and compare my initial impressions of these people with Bitterblue’s observations. I bought this book in North Carolina a year ago (a fact I had forgotten until I found this old blog post) and I’m finally getting around to reading it. It’s been sitting around my room for the past month or so, and half-heartedly carried with me on expeditions where I thought I might be needing a book but wasn’t sure. I’ve finally dived into it this past week because the Bitterblue paperback was too nice (and heavy, it’s one of those big thick ones) to carry in my backpack to work and… because I wanted Bitterblue to take longer. Now Finder has ALSO gotten really good and exciting. And so, I am now reading three really excellent books (in addition to Game of Thrones 3 and some other oddments), and I don’t want any of them to end. At about 11 am this morning, I posted the following status on the Wanderlust Facebook page: I’m working on a new Wanderlust illustration! Okay, it’s not actually for the book, but it’s got the characters and it’s in the same style. What do you think: Can I finish it in time to post it up on the Wanderlust blog by the end of the day? It’s 8 o’clock in the evening now and I haven’t finished the illustration, but I have been working on it almost literally all day. I made that facebook post to challenge myself, because as I embark on the “Finish ALL the Illustrations!” stage of Wanderlust, I’m terrified that I won’t be able to get anything done without the pressure of deadlines. I’m also terrified that I won’t be able to draw anything good. Today, even if I’m not quite ready to show you yet, I’ve proved to myself that I’ve still got what it takes to sit and draw all day. I really like how this illustration is turning out and I’m enjoying working on it—two self-esteem boosters that make me excited to begin the rest of the illustrations for my book. Here’s an itty-bitty preview just to whet your appetite, although it doesn’t give you a sense of the whole piece at all. The next challenge is to see if I can actually finish the piece within the next few days. If I can’t, well, then we’re in trouble… or at least back to wondering whether I’ll survive as an artist without scholastic deadlines. Quick and dirty sketches of my two principle characters. Hello! 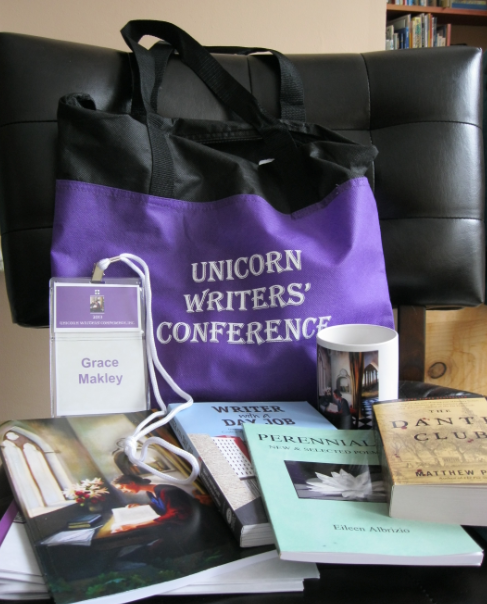 It’s been over a week since the Unicorn Writers’ Conference now. Life’s been pretty good. I’ve even been exercising. I’m trying to leave my book draft alone for a little while, even though Eileen Albrizio‘s workshop at the Conference made me want to FIND and DESTROY all the adverbs. I have been getting positive feedback from the good folks reading the current draft, though, which is awesome to hear. To keep my oar in and try to cultivate the habit of writing every day, I’ve been futzing around with book two. It’s still in the very early stages of development, but I’m playing with some ideas and I like what’s shaping up so far. 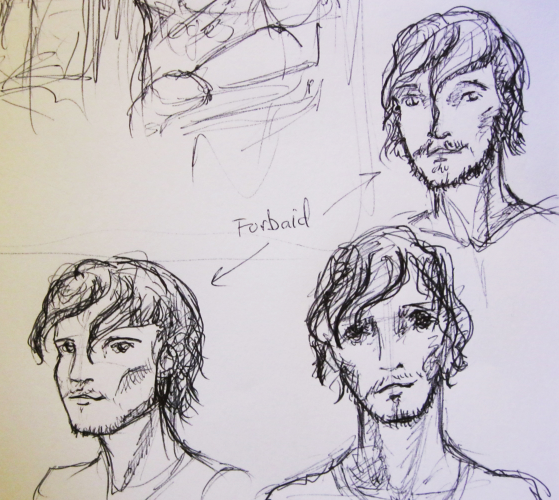 Mostly, I’ve been sketching and working on thumbnails for the rest of book one. I need to really tackle those illustrations soon. For now, I’ve been sketching with a cheap ballpoint pen and hoping that the permanence and nonchalance of the medium will take some of the pressure out of making pictures. It’s a ballpoint pen. I have to ACCEPT that the things I make with it will NOT be perfect—and this frees me up to just DRAW. One of my favorite (ha ha. They were all my favorite) workshops at the Unicorn Writers’ Conference was Writer With a Day Job with Áine Greaney. Writer With a Day Job is also the name of one of her books, which I bought and she signed for me. If you ever get a chance to meet Ms. Greaney or attend one of her workshops, I highly recommend it. She is a delight to listen to, and not just because of the Irish accent. She is a very clear and demanding speaker who holds your attention, makes you laugh, and says a lot of very true things that make you think, and keep thinking. She has a soft a soft voice and wields this power gently; the overall impression is of kindness, hilarity, and respect. You might wonder why I chose this workshop, since I have no day job to speak of. Well, not having a day job isn’t really a sustainable life choice. I’m even starting to suspect that having regularly scheduled, gainful employment, would help my writing—and this was one of the points of Greaney’s workshop. In fact, when I flipped through my Áine Greaney book looking for likely quotes, I came upon this: “Your day job can give you the structure you need to get things done” (19). I also found, in my notes from the conference, this bit of wisdom: “[Having a day job] takes [the] ego and financial burden away [from the writing].” That really resonates with me right now, because, as much as I’m living a cushy little existence as a writer/creative with parent-provided room and board, I am trying very hard to enter into the adult world and take responsibility for myself and for my obligations. In short, making those student loan payments at the end of every month stresses the crap out of me. If having a job meant I didn’t have to worry about paying the bills, it might actually free up more energy for my writing and creative pursuits. I attended this workshop in anticipation of getting a day job in the near future, and I attended the workshop to learn how to do it when I’m in the position of having a job and needing to write. It was the best choice I could have made; Greaney’s workshop gave me a lot of hope for my future and for the future of my writing and creative endeavors. The most important thing, Greaney said, is to ask ourselves this: Why do I write? What is my deeply personal reason for writing? What do I want from my life as a writer? When I asked myself these questions, I felt a weight lift off my shoulders. I remembered that it isn’t about getting published or making money and getting recognition for my work. I want all that, yes. I want it bad. But what it’s about is telling these stories. What it’s about is the love I have for my characters and the deep compulsion I feel to make something physical and tangible and shareable out of the stories and people I’ve created in my head. That, at the heart of it, is why I’m doing this—not for money or fame or a job. This realisation means—well, it means it’s okay if I have a day job for YEARS before the writer/illustrator lark can be my full-time occupation. It means that, as long as I’m creating and sharing these characters, I won’t have failed. The only way I will be a failure as a writer and an artist is if I stop working and creating every day. I can’t share the whole workshop with you here, so I highly recommend you check out the book if you’re interested. You’ll find a lot of good strategies about how to fit writing time into your busy schedule. I especially liked how Greaney talked about transitions between your work (or your life) and your writing. Sometimes you can’t go straight from one to the other, and it helps to set up transition rituals (like finishing that cup of coffee, or spending twenty minutes journaling, or putting on a specific sweater) that you always perform to get from one place to the other. I came away from the workshop with two overall messages. The first was: If being a writer is truly, deeply important to you (refer back to that deeply personal reason mentioned above), then do it, any way you can. Write every day. Make it happen. Use whatever available time you have, and make it work for you. And the second message? Be nice to yourself. Accept that you won’t be brilliant every day, and move forward on your writing anyway. At least visit it, even on the crap days when you have nothing left to give. It will all add up, and you will move closer to your writing goals. Saturday, I attended the Unicorn Writers’ Conference at St. Clements Castle in Portland, Connecticut. Some of my conference swag. It’s the title I would have given to a writers’ conference if I were designing one when I was ten years old (or even more recently; you all saw my Race to the 8th Calendar). The conference color is even purple, which is totally my color. Both signs, perhaps. I found this conference HUGELY valuable, inspirational, and educational. The Unicorn Writer’s Conference is a day-long event filled with workshops on various parts of the writing and publishing process. Many beginning writers attended, as well as all the professionals giving the workshops. Also in attendance were lots of literary agents. If you registered and paid for it beforehand, you could have a one-on-one session with a literary agent during the day, who would give you feedback based on the first forty pages of your manuscript. I didn’t have one these sessions, as I am still holding my recently completed manuscript draft rather close to my chest at the moment. I did, however, go to the conference fully prepared with business cards, the prototype version of Wanderlust from from May 2012 (it has current illustrations, even if the text is out of date), and an only slightly-rehearsed 30 second pitch (actually, I have a very well rehearsed five-second pitch. It gets a bit fuzzy after that). And I spent much of the day talking to people about my book. We hear every day about self-published books that do well and get picked up later by big-name publishers. John Cusick, however, advised me to submit to agents before self-publishing. This is because it can be awkward for an agent or publisher to take on a writer if there are already some copies of that writer’s book in existence. Obviously this depends on the situation and the individuals, but he said that agents and editors will often ask for changes and revisions before publishing a book—and if a thousand fans already have a copy of the book without those changes? It might be enough of a hassle that the agent decides to pass on signing the writer after all. This might especially be a concern for me because, if I self-publish, I will be dealing with the entirety of the book design, including illustrations and how they interface with the text. If I get an agent and a traditional publisher, there will be a book designer working with my book. I don’t want any contract for Wanderlust that doesn’t include my illustrations, but it has occurred to me that Wanderlust might really benefit from someone more experienced than I in the ways of fonts and margins and chapter headers. Anyone who thinks that stuff is easy or unimportant has never tried designing a book. Getting it traditionally published might mean a very different visual look than what I would create on my own. Even though I know self-publishing doesn’t mean you can’t go the traditional route later, Cusick’s point made a lot of sense to me. I think you can approach it from either side. You might say, “It can’t hurt to self publish before querying agents.” You could also say, “Yeah, but it can’t hurt to query agents before self-publishing.” I think it depends on your book, on your luck, on which agents you’re submitting to, and on your long-term publication goals. I’m still figuring out which path to follow, but right now I’m leaning towards querying first. It can’t hurt. John Cusick is an agent at the Greenhouse Literary Agency and the author of the YA novel Girl Parts. He also has a wordpress blog (http://johnmcusick.wordpress.com/). I highly recommend his March 4 post on the relationship between writing and work. Also, Girl Parts. I started reading the amazon preview today and I’m totally hooked. It’s dark, near-future, clean, scary, beautifully written, and very enticing. That’s what I got from the first few pages, anyway, and I’d like to read the whole thing very soon. 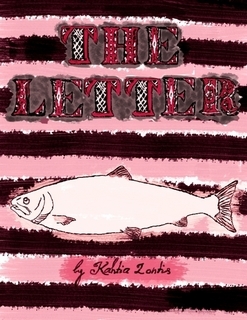 Also, there is a FREE kindle short story set in the same world called Abandon Changes. I’m going to read it as soon as I finish this blog post. I may get a lot of blog posts out of this conference, because talking with John Cusick was only ten minutes of a very full day. I have so many new things I’m thinking about that I hadn’t even begun to consider before. The Unicorn Writers’ Conference was right where I needed to be this weekend for my development as a writer and a professional, and I look forward to sharing some more of my insights with you in the days ahead. *Also, some of the reasons I’d prefer not to down-age is that Vanya is a very young 19-year-old, and the story doesn’t deal with any adult concerns like job, family, bills, etc. beyond the initial setup of Taniel’s “Lost my job, life is ruined!” sad-face in the beginning seven paragraphs of the novel. My point of view, given the above, is this: “These are young adults that teens will relate to, so there’s no problem with the current ages.” I’m aware that the flip argument is: “If they’re not really doing adult things and he acts younger than he is, why wouldn’t you just make them younger?” Ultimately, it’s a matter of figuring out where that line is between sticking to your artistic integrity and obstinately refusing to follow practical advice. Right now I think I’m on the side of artistic integrity, but if it’s something I keep hearing over and over again, especially from people who have read some of the book, I’ll have to consider changing my opinion. At one point this weekend, my brother, my mother, and I all sat on the couch reading. My brother had a sci-fi novel on his kindle. My mother had just downloaded a free book for her ipad mini. I held a real nice trade paperback copy of Fire Upon the Deep by Vernor Vinge. I don’t own any sort of e-reader. Over the years I’ve watched even my most bookish friends acquire kindles. They usually receive it as a gift, but then find that they actually enjoy the device, or at least find it useful in certain circumstances. I’m not actively agin’ em; I recognize that they can be very useful for travel, or for getting a book right away, or for carrying lots of books with you at once. I even read most of Game of Thrones on my brother’s kindle while visiting him this spring, and nothing about the e-reader impeded my enjoyment of the text. And yet… I am against e-readers. I love books too much. I love their shapes and sizes and smells. I love how they feel in my hand, and how they look on my shelf. I love their covers, I love every nuance of their interior design. Every font choice and every margin size is meaningful, and all these aspects are lost in a digital conversion. Lately, though, I do wish I had an e-reader, and for a very specific reason: I want to support self-published authors. While trawling the blogosphere, things pop up that look good. Sometimes you can even get past the first paragraph without choking on the bad writing. When I find a self-published book that feels like a real book, I want to read it. But here’s the issue: the kindle version of the book often costs between 3-5 dollars, while the hard copy, even a paperback, often costs as much as $20. Now, I am in a stage of my life right now where $20 is a lot of money. That’s a whole harp lesson, or nearly another month’s harp rental. It’s a whole 10% of a student loan payment. It’s half of what I owe the dentist for last month. It’s two hours of hard work. Basically, I don’t have $20 to spend on books right now, especially not multiple books. I do have a kindle reader for mac, but I don’t enjoy the experience of reading a book on my laptop. It feels illicit, somehow. If I want to read these self-published books as real books, with the amount of respect I would give to any published author, reading on the computer just doesn’t work for me. So I wish I had en e-reader. I don’t, and due to afore-mentioned money concerns, I won’t have one anytime soon. Since I’m not purchasing and reading these books, I figured the least I could do is share them with you. There’s actually a story behind this one, and you can read all the details at the author’s blog (http://abovetheseaoffog.com/a-tale-of-two-goats/ ) The author is trying to raise the money to travel overseas to meet her boyfriend. As much as my own experience has completely disenchanted me with the idea of online relationships, I’m still a romantic at heart. I find their story inspiring, I enjoy reading this lady’s blog, and I completely support overseas travel, so I want to help them fulfill their dream. And, okay, I actually just realized I didn’t have a good excuse not to, and I went and bought the book. So far it is delightfully surreal, although it’s an epub file so I had to download a new program to read it. Also, the paragraphs don’t appear to be properly formatted, which is really too bad… but it’s a short book, and I think I can handle it for a 30 pages. Anyway, check it out—it’s a cool feeling to buy a book and know you’re funding someone’s dream in the process. That’s it for today. Once again, I want to thank everyone who entered the Race to the 8th Contest. Thanks to last week, I am so close to being done with this stage of revision of Wanderlust. Also, I have not forgotten your prizes; I’ll update you on the status of those later this week.